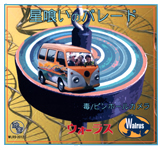 Walrus [Hoshikui no Parade] was released. This CD is based on the Basic of the second album “colloidal”.Three songs renewal and remixed by members of the current.17 minutes including unreleased.Self-produced CDR specification Innovation Paper Jacket. Buy the CD click here.